For the most part, period piece dramas that are based on “the-inspiring-true-story” usually don’t appeal to me. These usually come out around this time of year when they try to get Academy Award nominations. Sure they are typically high quality movies that are “by-the-numbers” perfect, but they are ultimately boring or lack creativity. Although The King’s Speech does look like it would be one of these standard movies, it is actually an enjoyable film that stands above the rest. Currently nominated for 12 Academy Awards which is pretty much every category including Best Picture, this movie certainly deserves them all. The music, the script and supporting actor Geoffrey Rush are all fantastic. 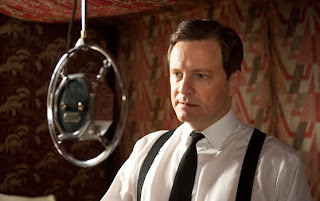 But the stand out aspects are clearly Colin Firth’s stuttering protagonist, as well as the directing. The film follows the true story of Firth’s King George the VI as he struggles to overcome his speech impediment and struggles with his position in the royal family. It’s a juicy role for an actor and Firth does a wonderful job with his stuttering without making it too frustrating to watch or over-the-top. The great thing about the directing is the framing of each shot. The Director shoots each scene with a purpose, so that the composition of the frame reflects how the character feels. This is nothing new, in fact this is an essential film-making technique, but it is notable because it attracts so much attention to itself. Some shots would be filmed so oddly that it is hard not too notice the statement, the director is trying to make. For instance, earlier scenes involving the main character struggling with his speech problem, are filmed so that the only thing in the frame is him - way off to the corner of the screen. This helps to show that he is exposed yet trapped by his own impediment. Many other techniques are used: when he is confident, the character is placed in center of the shot, when he is truly overwhelmed, a “fish-eye” technique is used, or when he feels afraid from being in the spotlight the camera is right in his face. Summary: With particularly fantastic directing and acting, this inspiring true story rises above the cliched film it could have been. #372 on my flickchart.com account.